Of all the famous and celebrated Indian street food in the world, vegetable pakoras are ranked at the top, along with samosas, chaats — and perhaps dosa and idly, depending on if we’re talking about North Indian street food or South Indian street food. Is there a difference? You better believe it. But where do the two meet? Conceptually, veg pakoras (or pakodas or bhajji or even veg fritters, depending who you ask) are something found in both North and South India, and the love and lust for them is equal. It’s not a culinary civil war as with the chapati (roti) vs. rice battle of the traditions. With veg pakoras, the spices vary and the vegetable ingredients certainly vary, but the idea and the appreciation are shared. While we’re on the subject of pakoras: in many places in India you’ll find not just pakora made with all kinds of vegetable bits, but also fun things like deep-fried pakora-battered sandwiches and slices of bread. In my many trips to India and especially in the year living there, I’ve had the opportunity to eat veg pakoras from hundreds of different places. I actually ate them a lot more eating out than eating at home with families. I will say, some of the street vendors and store fronts have some pretty grubby setups, and I wouldn’t recommend eating the samosa and pakoras from just any train station vendor. But still, there’s almost always a decent enough place to be found. If not… just step into your own kitchen! This one is my favorite vegetable pakora recipe and the one I come back to the most. (See the variations below for more ideas!) This recipe is great for dinner parties, spicing up a weekend afternoon lunch or brunch, or just make them for yourself. I’m not ashamed to admit I do that kind of stuff all the time. p.s. 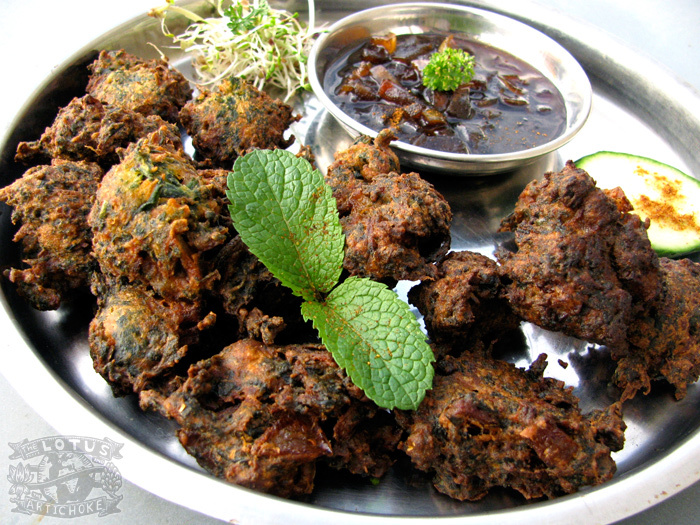 If you want to read more about pakoras, check out my guest post A Tribute to Indian Pakoras on Waegook Tom’s travel blog! In small pan on medium heat, lightly dry roast cumin, coriander, ajwain for 2 min. Combine all ingredients (except oil!) in large bowl. Add water last, gradually. Mix well. Add more water or flour if needed. Batter should be moderately thick, slightly runny. Let batter sit for 15 min. Heat approx 1.5 in / 4 cm oil in small pot on medium high. Oil is ready when small drop of batter sizzles, surfaces immediately. Carefully push a spoonful of pakora batter into hot oil. Fry 5-6 pieces at a time until dark golden brown, turning occasionally, about 4-5 min. Remove with slotted spoon, drain, transfer to bowl or plate. Repeat until all of pakora batter has been transformed into crispy veg pakoras. Garnish with fresh mint, coriander, or parsley. Serve immediately with chutney. Heat oil in a small sauce pan on medium. Lightly fry coriander, cumin, garam masala, 2 min. Add water, bring to boil. Add apple, tamarind, sugar, spices, salt, lemon juice. Mix well. Reduce to low heat. Stirring occasionally, Simmer uncovered until thickened, 20-30 min. Allow to cool and thicken 15 min. Frozen instead of fresh spinach: Use 2/3 cup / 5 oz / 140 g frozen spinach: thaw, drain. Water from spinach can be used for batter. Adjust flour and water for batter consistency accordingly. Other vegetables: experiment with other greens, peas, corn, chopped cauliflower, zucchini, bell pepper, grated potato. Vedic-style: just replace onion with 1/2 cup carrot or other chopped vegetable. Extra crunchy pakoras: Add 2 Tbs rice flour to batter, adjust water if needed. Thicker chutney: Add 1/4 chopped dates or raisins. This entry was posted in Indian, North Indian, South Indian and tagged north indian, pakora, recipe, spinach, tamarind, vegan. Bookmark the permalink. Confession time: I’ve only once had pakoras, and they were the frozen kind from Trader Joe’s. Predictably, I was none too impressed, so I would sure love to taste how the real ones compare! Being fresh, I’m sure they’re a million times better right off the bat. Lovely recipe for pakoras. I love the use of apple in your tamarind chutney too. First time for me to visit your blog – great recipes, photos and a very interesting story. Cheers from one global nomad to another! Thanks, Ramya! I really like your site a lot, too… and especially your worldly-nomadic-culinary story. I need to go back and visit your site and find a good place to comment on our mutual love of Little India / Sri Lanka in Paris! I mentioned that district briefly in my vegan quiche post and I’ll be writing about it more eventually. You asked about my fig tree. My husband & I bought our house 1/2 year ago & the fig tree was already there. It would be 8 years old. We cut the tree, this november, very short & gave it a very nutrious soil, espially for figs. It is in the ground & does need a lot of water, daily, especially when it is very hot. In my garden, there is a micro-climat. It is a walled garden. So it is sometimes 43° C instead on the street, it is 30°C. I hope you can grow a fig tree! :) Good luck! Thanks, Sophie. I always enjoy your visits and comments. That’s great about the Persian eggplant… several people have written and told me how good it turned out for them, too. I really want to get a fig tree but think it might have to wait for more rural living or Gartenhaus project. I’m impressed with your garden set up. We only have herbs and tomatoes and sometimes chilies on the balcony and on the kitchen windowsill. Heute! Das Rezept gibt’s auch nun auf deutsch! Viel Spass!